The HubbleSpace Telescope appears to be in good health after weeks of troubleshootingfollowing a debilitating glitch that thwarted its ability to beam cosmic imagesback to Earth, NASA officials said Wednesday. Engineers reactivated Hubble?s science instruments over the last week and arepoised to release the first new image from the iconic orbital observatory onThursday, said Susan Hendrix, a spokesperson for NASA?s Goddard Space FlightCenter in Greenbelt, Md., where spacetelescope operations are based. ?I?m sure they?re relieved,? Hendrix said of Hubble?s engineering team. ?Theyare just probably back to checking and double checkingtheir work.? 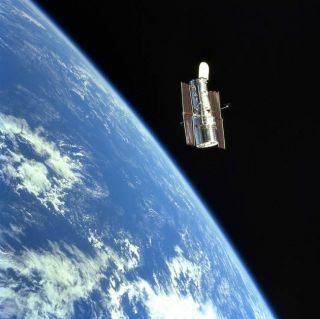 The Sept.27 failure of a vital data relay channel left the 18-year-old Hubble telescopeunable to transmit the bulk of its science data and imagery.The channel, the Side A relay of Hubble?s Science Instrument Control and DataHandling system, had been working properly since the telescope launched inApril 1990. Efforts toswitch to a backup Side B channel last week met with challengesof their own, with two separate glitches thwarting the initial attempt. Buta second try appears to have been successful, with Hubble engineersreactivating the telescope?s main science instruments over the last week. Hubble?sSeptember data relay channel failure prompted NASA to delay a planned Oct. 14space shuttle launch to send seven astronauts to the orbital observatory on a fifthand final service call to the telescope. That mission is now slated to flyno earlier than February, with Hubble engineers testing a spare data relaychannel to see if it can be added to the shuttle?s cargo bay and be installedduring the flight. Hubbleofficials are expected to give an update today at 5:00 p.m. EDT (2000 GMT) on plansfor the servicing mission. Theservice call is expected to include five spacewalks to add a new camera,upgrade guidance equipment, replace aging batteries and gyroscopes, deliver adocking ring and include repairs for systems never designed to be repaired inspace. The finalHubble overhaul is expected to extend the space telescope?s mission lifetimethrough at least 2013, mission managers have said.